From what I’ve played of The Last of Us so far, I feel like I’ve heard the set-up to a joke but not the punchline. It has an interesting premise, both for the gameplay and story, but it needs to considerably change the pace if the game is to be prevented from becoming stale. But I’m not going to judge The Last of Us on what I haven’t played. I’m going to judge it on what I have played, being all of the beginning portion in the city, and nothing beyond that. Luckily, The Last of Us seems to be a tense, well-put together game, even though the pattern of gameplay can become a bit rote at times. I’m of two minds on the story of The Last of Us. One one hand, it’s what I imagine a typical zombie story is like (my only experience being the first handful of The Walking Dead comics). On the other hand, it’s told pretty well. The voice acting is really good, even for most of the NPCs, which is not something I am used to in any game. While there are cutscenes in the game, I was surprised to find that very few ran over two minutes, instead preferring to have the story play out in-game. It is easy to tell that this is a last-gen game, but then again, it’s also easy to forget. It falls within the odd category that a lot of remakes fall under where it has beautiful textures but awkward-looking models. The game is appropriately moody, with dark and grey environments and a soundtrack usually consisting of subtle riffs on a guitar, or just silence. So far, this isn’t the kind of game that I’d say makes the most convincing case for games being art, but it’s entertaining all the same. 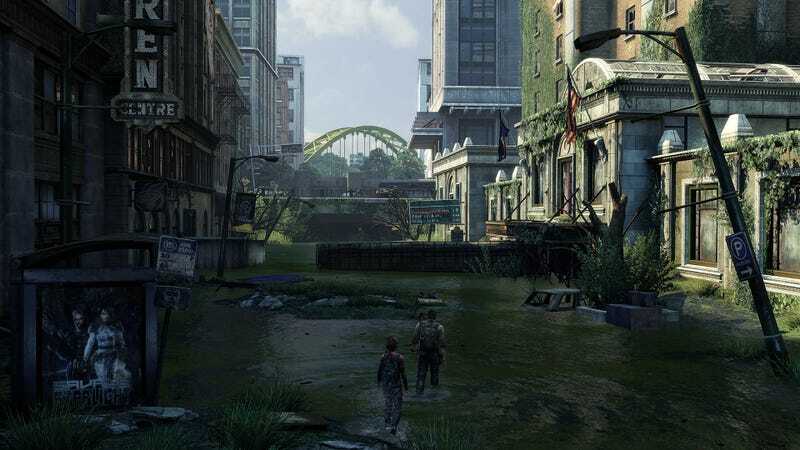 There are essentially two different things you go back and forth between doing in The Last of Us: shooting zombies or humans, and walking to the next place where you will shoot more zombies and humans. That is, of course, grossly simplified, but it is the basic pattern. Only I lied a little bit. While yes, you do shoot zombies and humans, I found myself shooting a lot less than I expected to. The Last of Us is like Breath of the Wild in that everything you use to fight, heal, or access new areas is a limited resource. What is very different from Breath of the Wild, however is that The Last of Us is a very, very linear game. You go from room to room, or point A to point B, and unless I’m missing something, there is absolutely no going off the beaten path beyond a small room with goodies in it. This means that the game dictates how many resources you get, which allows it to throw some interesting challenges and decisions at you. The game is also very forgiving, with each new “encounter” serving as a checkpoint that you will return to if you die. There was one time when I kept dying in a room with three “clickers,” zombies that can’t see but can’t be strangled, unlike most other enemies, unless you use a shiv. That shiv gets used up once you use it once. I only had one shiv in my possession, with no resources to make more. This meant that I could only take out one clicker through stealth, and I had to figure out how to deal with the other two. Clickers are tricky because they can kill you in one hit if they get too close, so I had to find a way to prevent that from happening. I finally settled on taking out the closet clicker with my shiv, then waiting for the other two clickers to get as far away from me as possible without having them leave my line of sight. I then got my gun that could shoot the most bullets without having to reload, and shot at them until they were getting a little too close for comfort. I then got out my crowbar and started wailing on them until they went down. I tried my shiv, crowbar, and gun multiple times on these guys without avail, and I was only able to defeat them once I combined my usage of all three without relying on only one. In this way, combat in The Last of Us is more like a puzzle, relying in part on skill, but much more in patience and perception. When I’m playing right, there tend to be a lot more quiet yet tense moments instead of running and gunning. Walking in The Last of Us is a way to catch your breath while taking in the world. Most of the time, the characters will chat away, which is fine, because what they have to say is rarely, if ever, filler. This is where the majority of story takes place; not the cutscenes. I hesitate to call what you do in this part of the game a “puzzle,” but you will occasionally have to find something, such as a plank, ladder, dumpster, etc. to progress. The irony here is that the actual “puzzles” fail in comparison to the puzzle of combat. So far, they rarely go beyond “find the thing, put the thing here, climb up the thing.” All the same, it’s apparent that these parts of the game are to aid the storytelling, and perhaps a puzzle that was too engaging would distract too much from that goal. Still, a bad puzzle is a bad puzzle. So far, The Last of Us seems like a one-trick pony. It does one thing, which is combat while telling a cool zombie story. It does this very well, but I can imagine this getting old pretty fast. Luckily, I’m told this game is very short, so I’ll hopefully be at the credits before I start getting tired of it.